By utilizing skills of our experienced professionals, we are Leading Trader of Roofing Nails. For maintaining our reputation, the offered roofing nails are manufactured utilizing top grade material and contemporary machines according to the set industrial norms. 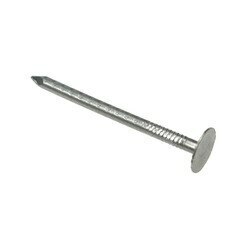 By considering needs of our customers, we offer these roofing nails in diverse specifications. Additionally, we supply these roofing nails from our end after testing upon numerous parameters of quality. Features: Optimally finished High strength Enhanced durability We supply our wide range of Products in Vadodara, Gujarat, India.